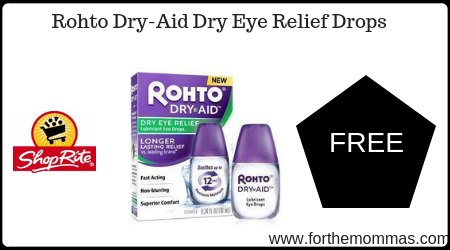 ShopRite: FREE Rohto Dry-Aid Dry Eye Relief Drops Starting 4/14! Starting 4/14, ShopRite has Rohto Dry-Aid Dry Eye Relief Drops priced at only $4.94 each. In addition to this, we have an Ibotta rebate to stack with this deal that will make your final price FREE + $0.06 moneymaker!